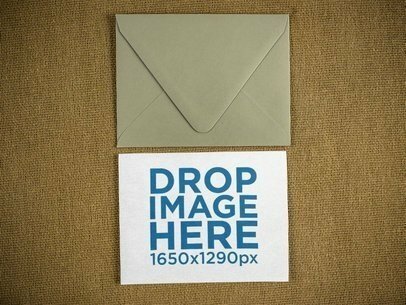 Check out this awesome template of an invitation card with an envelope, they're lying above a solid surface. All you have to do is drag n' drop an image file on the interface, we will merge it for you in just seconds. Awesome, isn't it? Start using Placeit to make your designs stand out! Try another Invitation Mockup here! Take a look at this beautiful visual asset by Placeit! 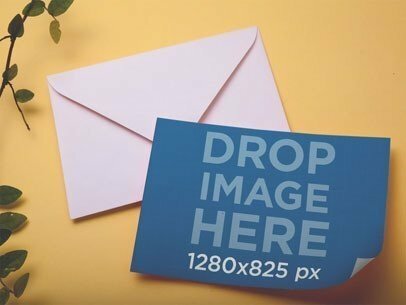 It's an invitation on an envelope lying on a three-colors background, a gorgeous and versatile image that you can use to showcase your design in a creative and professional way. You can choose the combination of colors in the background and drag-and-drop an image file on the interface to merge it with the invite. Start now and make your revenue grow! Try another Invite Mockup here! 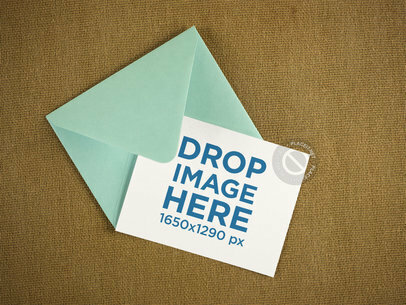 Check out this awesome mockup of an invitation card in an envelope standing on a solid surface! It's a really cool visual asset that'll help you build a better image marketing! All you have to do is drag n' drop an image file on the interface, we will merge it for you in seconds only. Isn't it great? Try another Invite Mockup here! Start showcasing your designs with Placeit! 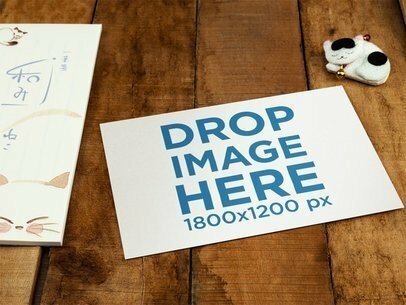 This template features a postcard lying on a wooden table with a kitten toy and paper nearby, it's a beautiful image that will make your marketing grow! Powerful visual assets make people feel engaged to your designs. Just drag and drop an image file on the interface, it'll be merged in just seconds. Try another Postcard Mockup here! Start showcasing your awesome postcard or invitation designs with Placeit! 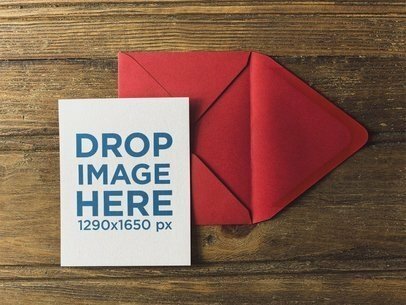 This template features an invitation lying on a red envelope over a wooden table, it's a great visual asset that will help your promote your designs in a smart way. Start now! Drag-and-drop an image file on the interface, we will merge it for you in just seconds. Try another Invitation Mockup here! 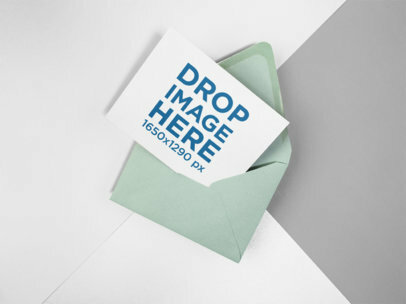 Check out this awesome mockup of an invitation coming out of an envelope, it's a gorgeous visual that'll help you build a better connection with your audience! Use it to showcase your latest design or logo, it's a powerful visual asset that'll enhance your ideas. Drag n' drop an image file on the interface, we will merge it for you in just seconds. 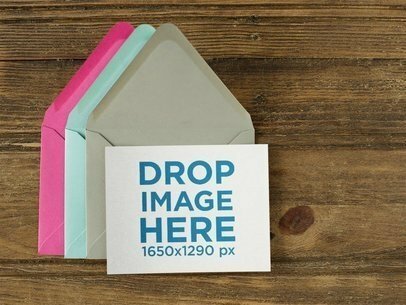 Try another Envelope Mockup here! 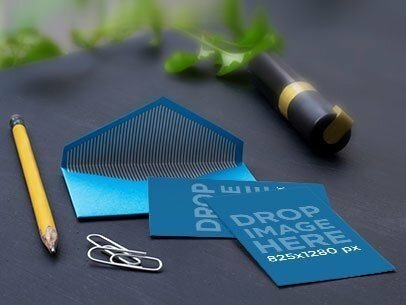 Have a look at this awesome mockup of an invitation lying with an envelope on a transparent surface, it's a really awesome and versatile image that will help you build a better image marketing. Start now using Placeit and make your income grow! You just have to drag n' drop an image file on the interface, we will merge it for you in just seconds. Try another Invitation Mockup here! Start showcasing your latest designs with Placeit's templates! 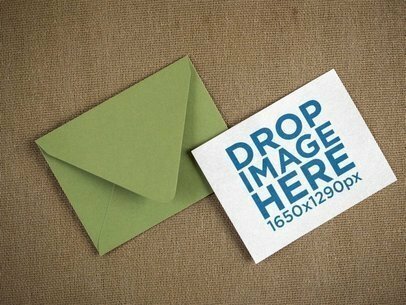 This one features an invitation on a light green envelope while over a brown surface, it's a really simple and awesome image that will help you build a better image marketing. Drag-and-drop a jpeg or png file on the interface and wait a couple of seconds until it's merged with the invitation. Awesome, right? Try another Invite Mockup here! 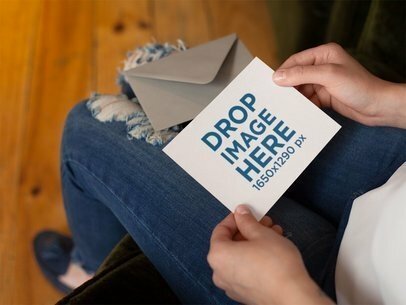 Promote your awesome designs with this mockup of a girl reading an invitation while sitting down, she also has the envelope on her lap and the floor is made of wood. Drag-and-drop your image file over the interface, we'll merge it for you in just seconds. Amazing, right? Try another Invitation Mockup here! Check out this beautiful close-up template of an invitation lying above a light green envelope, they're both on a wooden surface. Drag-and-drop your image file over the interface, we will merge it for you in just seconds. That's right, sit back while we do the hard work for you. Great, right? 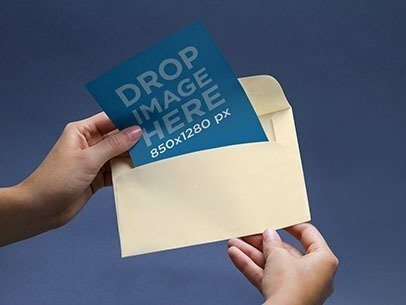 Try another Envelope Mockup here! Ready to print it out? Check this print sizes guide on the blog! Check out this awesome mockup of an invitation being held near a red envelope while on an old wooden table, it's a beautiful visual asset that will make your designed invitation stand out at a glance! All you have to do is drag-and-drop an image file on the interface, we will process it for you in just seconds. Make your revenue grow with Placeit! Try another Invitation Mockup here! 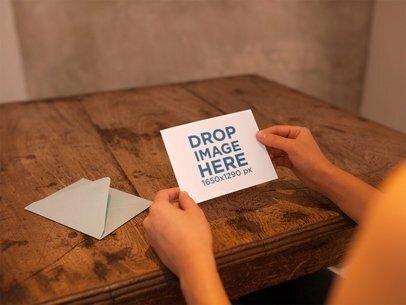 Check out this awesome mockup of a girl holding an invitation on a wooden table, it's a great option for you to display your latest designed invitation to your audience! Start now by dragging and dropping your image file over the interface, we will merge it for you in just seconds. That's right, that's all the work you have to do. Try more Postcard Mockups here! Start showcasing your beautiful designs for an invitation with Placeit's beautiful mockups! This one features an invite over three colorful envelopes on a wooden table, it's a great option for you to start displaying your ideas. Start now by dragging and dropping an image file on the interface, it'll be processed by Placeit in just seconds. 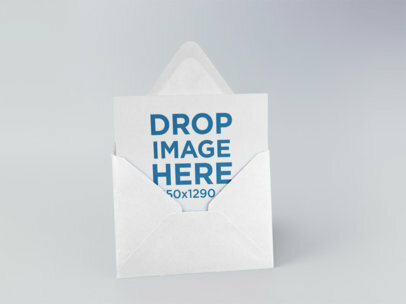 Try another Envelope Mockup here! Promote your designs with Placeit! There are a lot of different compelling visual assets that you can use from us, you'll surely get your customers attention with them. This one features an invite coming out of a green envelope, it's a really good option for you to showcase your invitation designs. Drag-and-drop your image file over the interface and we will merge it for you. 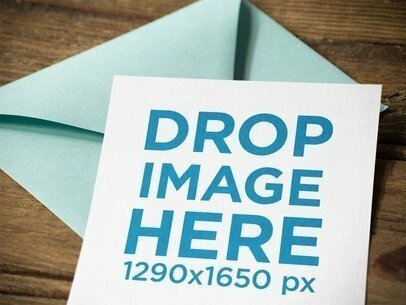 Try another Envelope Mockup here! Showcase your awesome design for an event's invitation with this invite template, it has the invitation lying above a red envelope, there's also a red coffee mug and everything's on a wooden table. Drag-and-drop a jpeg or png file on the interface to merge it with the invite and make your audience love you! Beautiful visuals make your ideas stand out. Try another Invite Mockup here! Showcase your design for an invitation to your audience with this beautiful template of an invite lying on a table with an envelope above it. It's a really awesome template that can make your design stand out! Just drag-and-drop an image file on the interface, it'll be merged in just seconds. Placeit has a lot of different templates for you to sell your designs in a creative way. Try another Invite Mockup here! 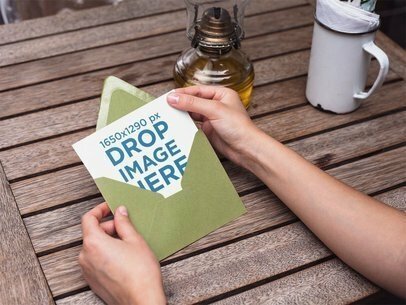 Check out this awesome template of a green invitation envelope being opened by a girl with a tattoo on a wooden table, it's an excellent mockup that will make your revenue grow immediately! Showcase your designs to your customers with it by dragging and dropping a jpeg or png file of yours. Sit back for a couple of seconds while it's merged automatically. Amazing, right? Try another Invite Mockup here! 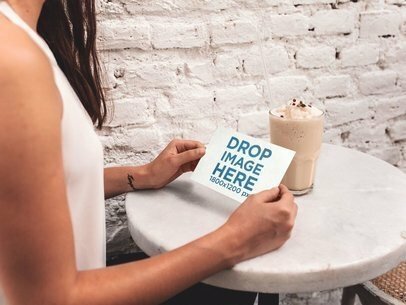 Start promoting your event, designs or ideas with this beautiful template of a girl reading a postcard while sitting down at a white cafe! It's a beautiful visual asset that will enhance your image to make it eye-catching, thus attracting more people to your products. Start now by dragging and dropping a jpeg or png file of yours to the interface. After a few seconds you'll see it merged with the postcard. Isn't that great? Try more Postcard Mockups here! 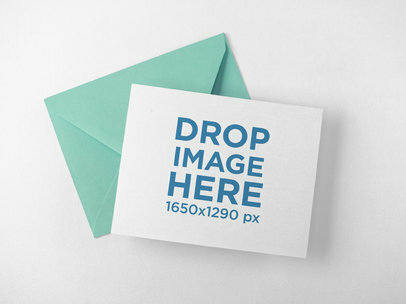 Showcase an image of your event's invitation with this template of a green envelope with an invitation besides it! It's a perfect choice if you are looking to display your designed invite in a creative way. All you have to do is drag-and-drop an image file on the interface, we will process it for you in just seconds. Try another Invite Mockup here! 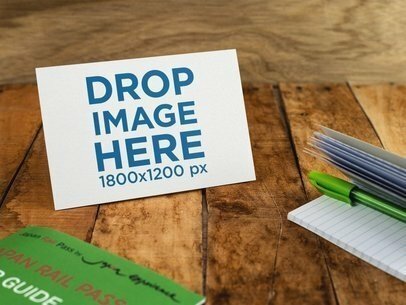 Check out this awesome template of a postcard standing on a wooden table, it's a great option for you to showcase an amazing postcard design or an invitation! Start by dragging and dropping your image file on the interface, we will process it for you in just seconds. That's all you have to do! Amazing, right? Try more Postcard Mockups here! Promote your business using Placeit's marketing tools and start gaining success right away! 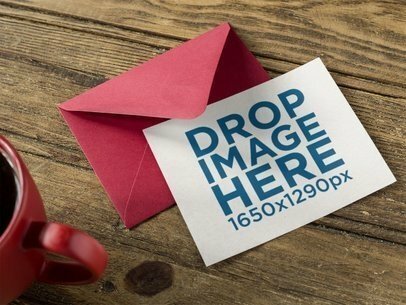 This mockup features two business cards lying on top of an envelope. Make this creative mockup part of your visual marketing campaign and advertise your ideas in a fresh, unconventional way. All you need to do in order to start using mockups is drag and drop an image onto the business cards on the template or input a URL address. Never again suffer looking for an original way to market your ideas and make Placeit an essential asset of your marketing strategy starting now! Impress clients and viewers by using this beautiful, eye-catching stationery mockup from Placeit. 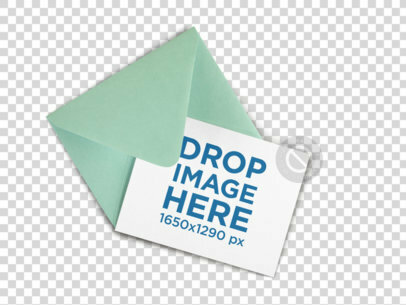 This envelope mockup features an open envelope on top of a desk next to some office supplies with two invitations laying next to it. Personalize this great image and make it your own by just simply dragging and dropping an image onto the template. Marketing tools form Placeit make it fast and easy for you to create exceptional visual content you can start using within minutes! Be bold and take a risk by using Placeit's stationary mockups as part of your visual marketing strategy to stand out from the rest of the competition. 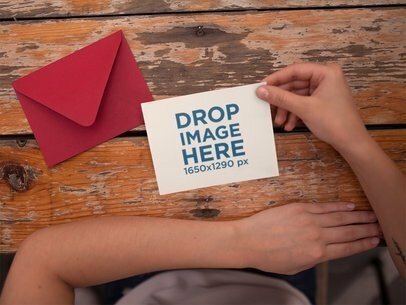 This envelope mockup features a person opening an envelope and taking out a card from it. 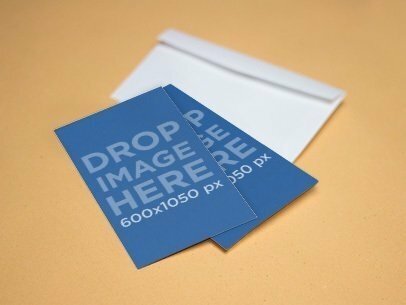 Imagine if it was your business ideas being displayed on the card in this envelope mockup, wouldn't that be cool? Start using this stock photo right away by simply dragging and dropping an image onto the template and let Placeit do the rest of the work for you. Visual content had never been this easy and fun to create! Please note that colors will be removed from your design to best match the embossed card. 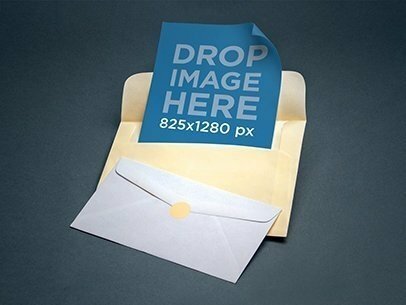 Add this envelope mockup to your visual marketing campaign and showcase your ideas in an innovative way. 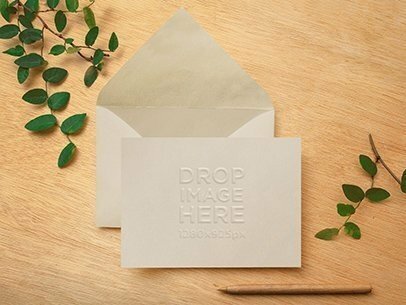 This stationery mockup features an open envelope sitting on top of a wooden desk next to a pencil and some plant leaves. This position of the elements on this image is beautiful, all that's missing is an image of your business to make it complete. In order to create amazing visual content all that you need to do is drag and drop an image of your choice onto the template. What are you waiting for? Start using mockup today! 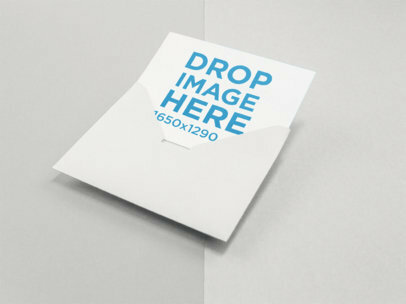 This stationery mockup features two envelopes, one lying on top of the other. One of the envelopes is sealed, while the other one is open and you can see an invitation coming out of it. 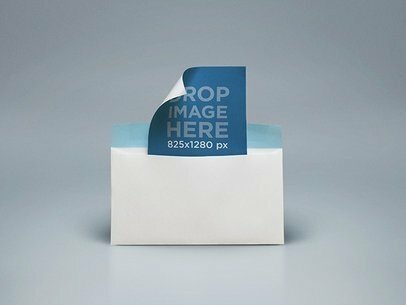 Use this envelope mockup to help you publicize your business latest idea or product in an original way and stand out from the competition. What are you waiting for? Enhance your visual content and make sure to catch everyone's attention by making Placeit's marketing tools an essential asset of your marketing campaign today! Make this stationery mockup part of your visual marketing campaign to help your showcase your latest ideas and boost your business branding strategy. 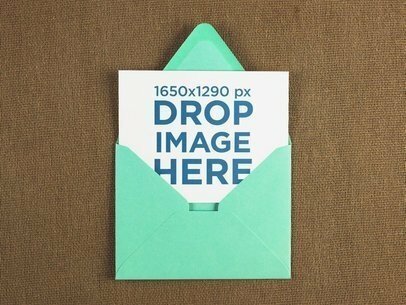 This envelope mockup features an open envelope with a card coming out of it. Use this mockup to help you display your latest design and make an impression on the market. Just drag and drop an image onto the template or type a URL so Placeit can do the rest of the work for you.